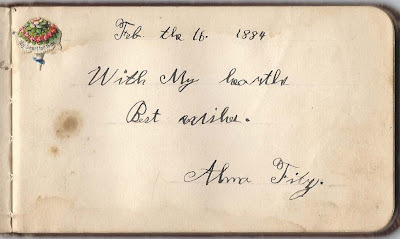 1880s autograph that belonged to Bertha Fitz of Carman, Illinois. 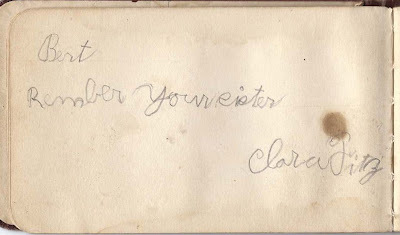 The album is approximately 5" x 3" and contains 48 pages signed by Bertha's relatives, friends and schoolmates. An alphabetical list of the signers appears at the end of this post. 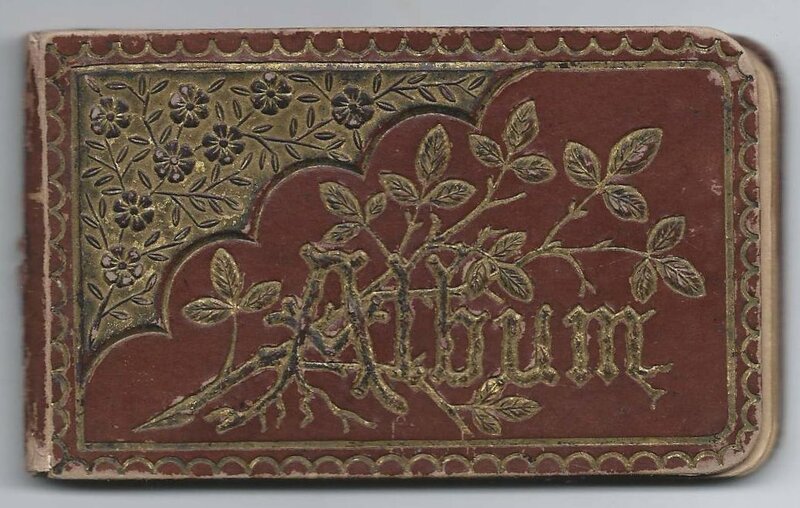 The album is in rough shape and is missing a title page and perhaps also some pages at the beginning or end, but not many, if any. 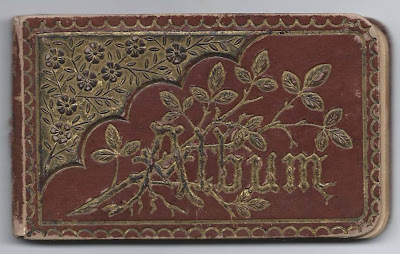 Bertha T. Fitz was born 22 October 1873 at Carman, Illinois, the daughter of Gebhard and Emma Elizabeth (Kunze) Fitz, who were born in Austria and Germany respectively. Bertha's paternal grandparents were Gebhard and Helena (Peters) Fitz. Her maternal grandparents were August and Theresa (Albrecht) Kunze. On 4 October 1893 in Henderson County, Illinois, Bertha married George Edward Chandler, son of George W. and Annie Elizabeth (Walter) Chandler. George E. was born about September 1868 in Henderson County, Illinois. The couple farmed at Stronghurst, Illinois and raised, I think, seven children. Young Clara Fitz signed a page in her sister Bertha's album . 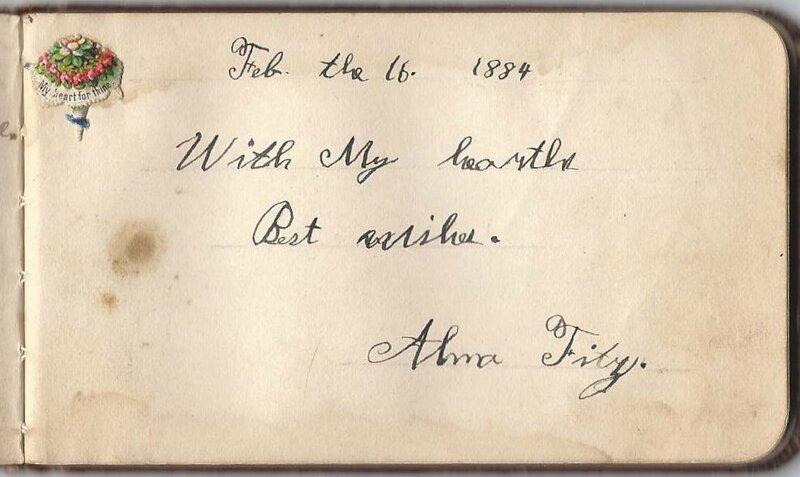 Alma Fitz signed a page in 1884. She may have been Bertha's sister. 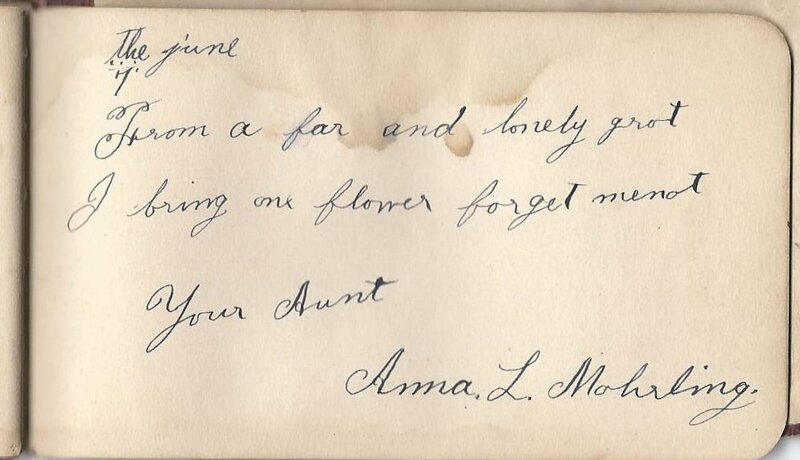 Bertha's aunt, Anna L. Mohrling, signed a page. 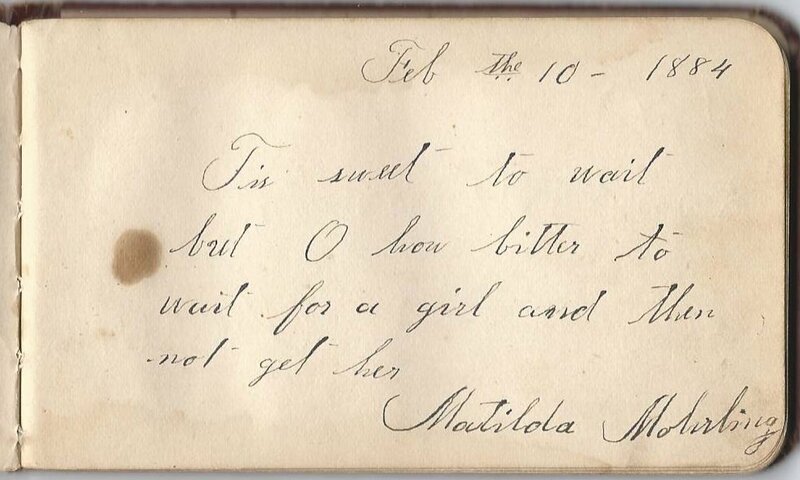 I wonder if she was the half sister of Bertha's mother Emma Elizabeth (Kunze) Fitz. 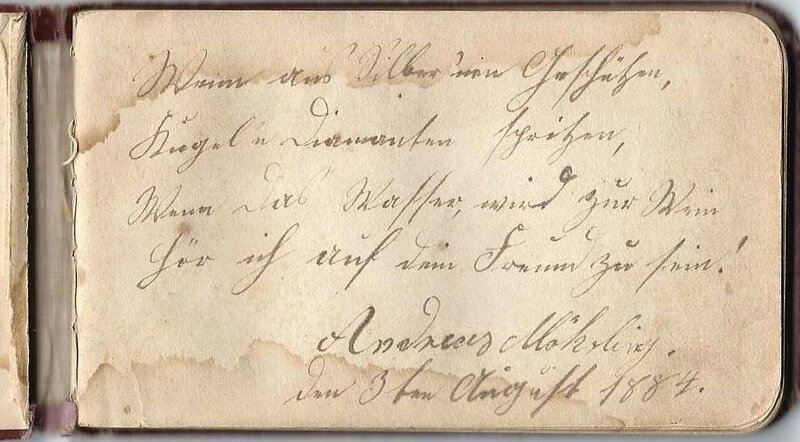 Emma's mother was Theresa Albrecht, and I found a Theresa Albrecht who was married to Karl Heinrich Mohrling. 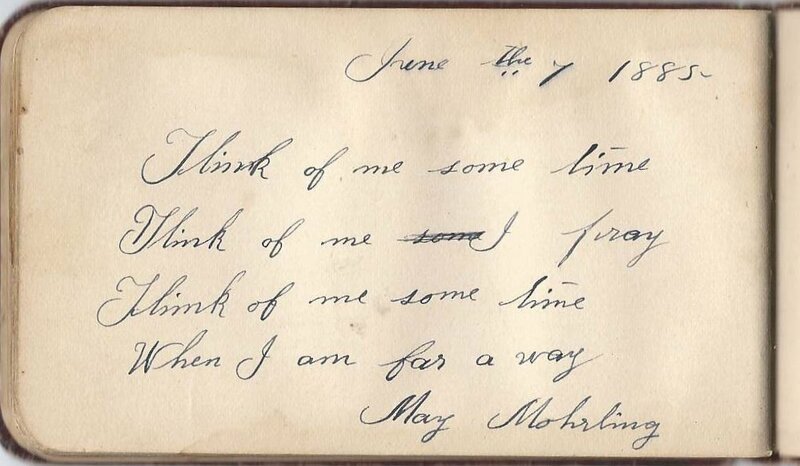 Several other people named Mohrling signed pages in Bertha's album. 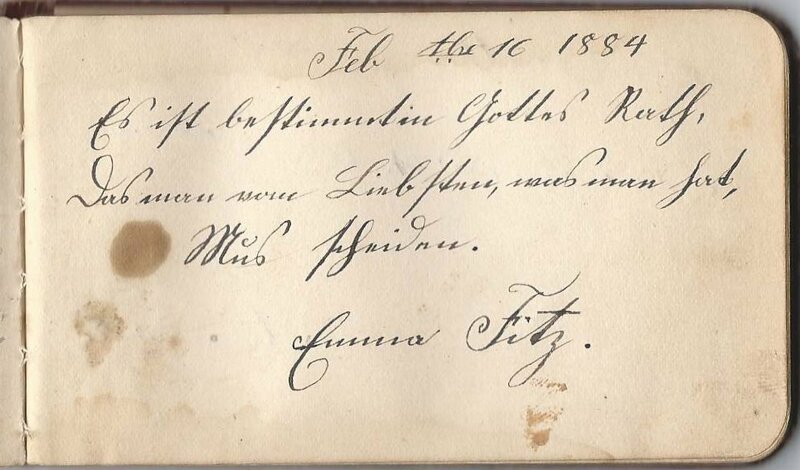 One of them signed the first page in the album, in German, in 1884. 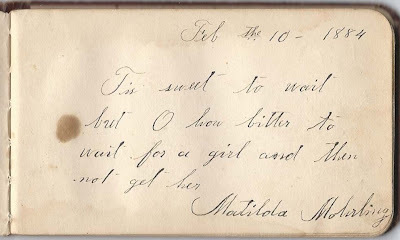 Matilda Morling signed a page in 1884. 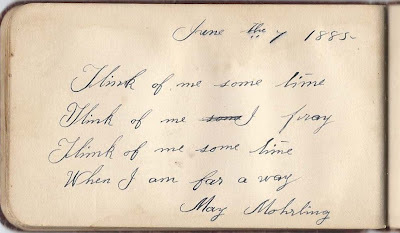 May Morling signed a page in 1885. 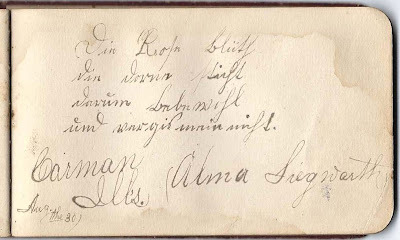 Thanks to a collaborator on the Heirlooms Lost and Found community on Google+, I have a translation for the following page, signed by Alma Siegwarth of Carman, Illinois. 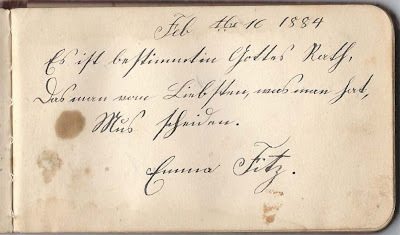 If you have corrections and/or clarifications to the information above, or can provide a translation of the pages written in German, please leave a comment or contact me directly. Thanks! Anna L. Mohrling; Bertha's Aunt. 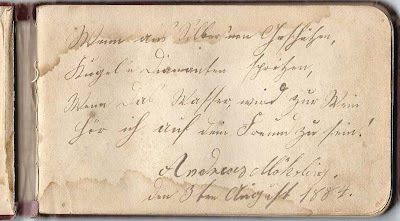 I wonder if Anna was a half sister to Bertha's mother through their mother Theresa (Albrecht) Kunze who possibly later married Karl Heinrich Mohrling? 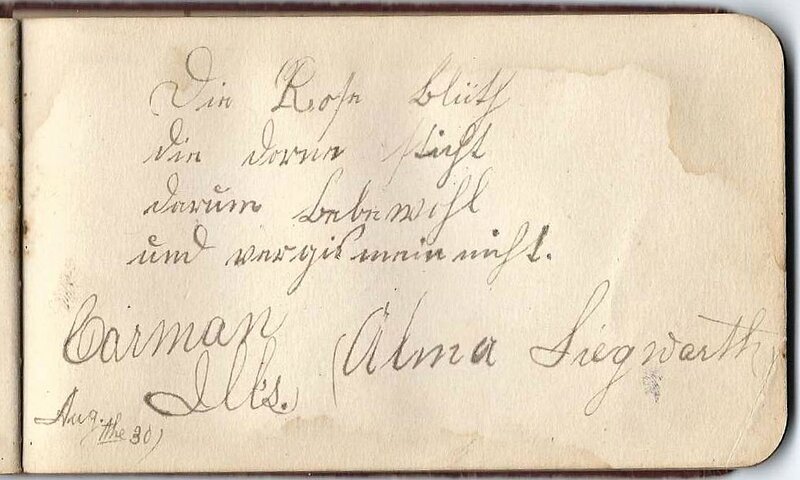 Her mother's verse is from a hymn and is translated here: http://www.recmusic.org/lieder/get_text.html?TextId=5629. Judy, thanks so much! I'm amending the post. I am a relative from Bertha from Austria! My grand-grand-father was a cousin from Bertha! Omigosh - that's wonderful! Thanks for writing, Anneliese. I'm so glad you happened upon this post and that it connects with your family! Hi! Is this Album for sale?? Yes, the album is for sale. Please contact me at my email address in the right column near the top.